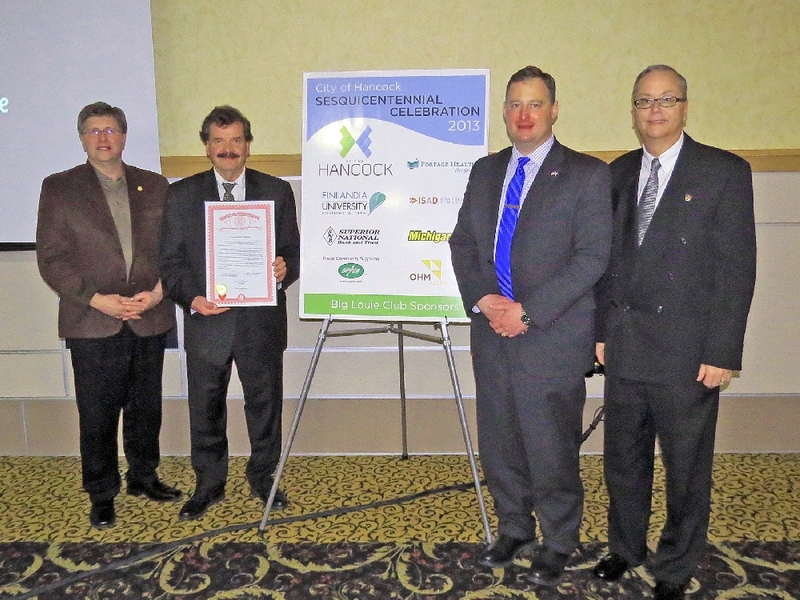 Follow this years sesquicentennial events in encapsulated form here. 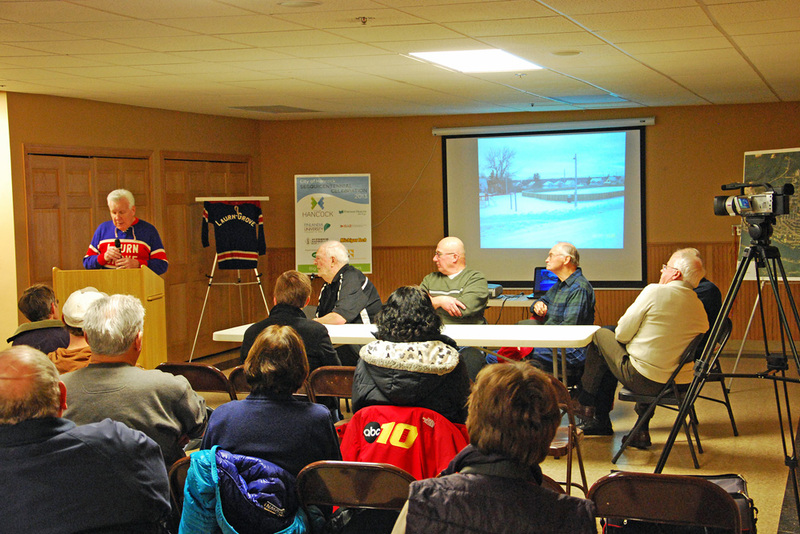 January’s even is a Panel Discussion of the Hancock Outside Hockey teams and Rinks, and the players who used them. Held in the Dave Wiitanen Room of the Houghton County Arena. 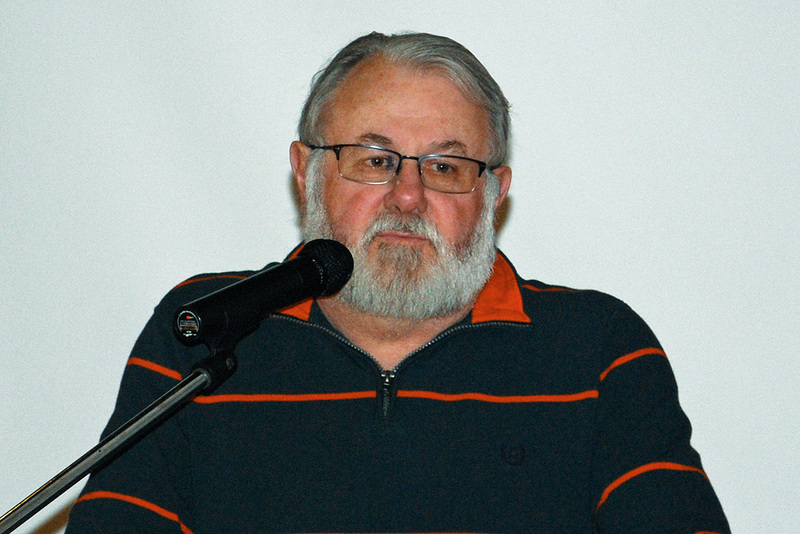 Dave Hermanson moderates. 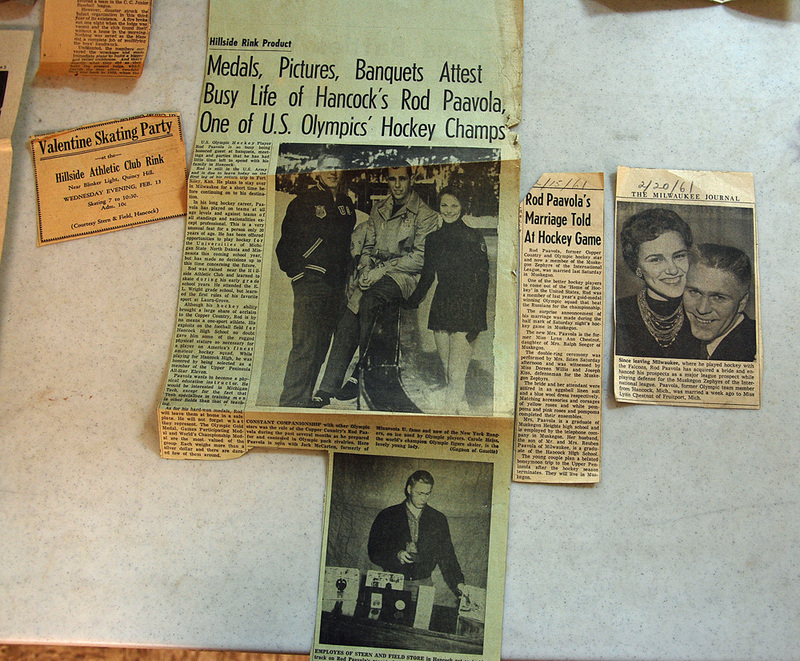 A look at some of the clippings made available for Olympic Gold Medalist Rod Paavala (deceased), who won his gold medal in 1960, and who played early hockey on the Hillside Ice Rink, just a few doors away from his home on Shafter St. PICTURING THE PAST, FINALNDIA UNIVERSITY, 1896-2013 A lecture by Karen S. Johnson, Executive Director of Communications & Marketing, Finlandia University, was the February Celebration event, held at the Finnish/American Center on Feb. 27th. 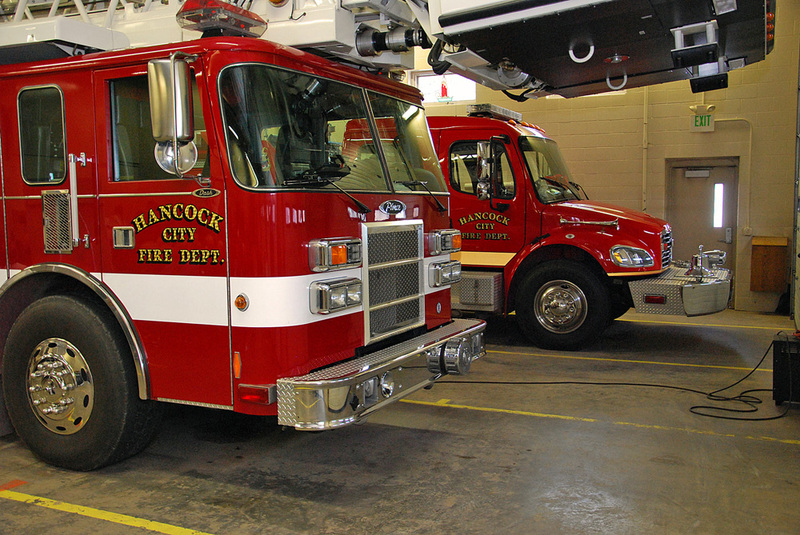 Two of the City of Hancock VFD Fire Trucks stand ready for any call, as the Department holds a historical review of major fires in the City over the years, as a part of the Sesquicentennial Celebration. John S. Haeussler, City Council member, and Sesquicentennial Committee Chairman, opens the Historical Review, with some remarks about other activities being held this year. 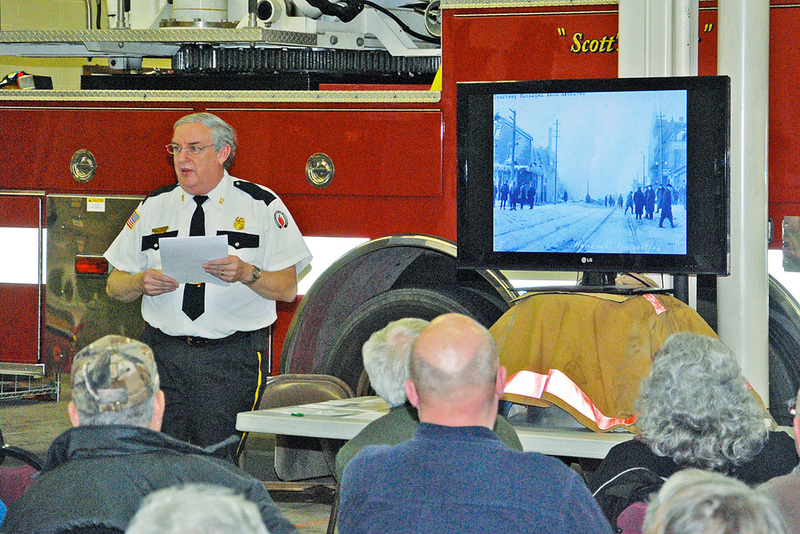 Captain Mark Dennis, of the Hancock VFD, gives a review of the major fires that occurred in the city since its beginning, and listened to comments and questions from a very interested audience. The fire on the Monitor happened in the early 1920s. 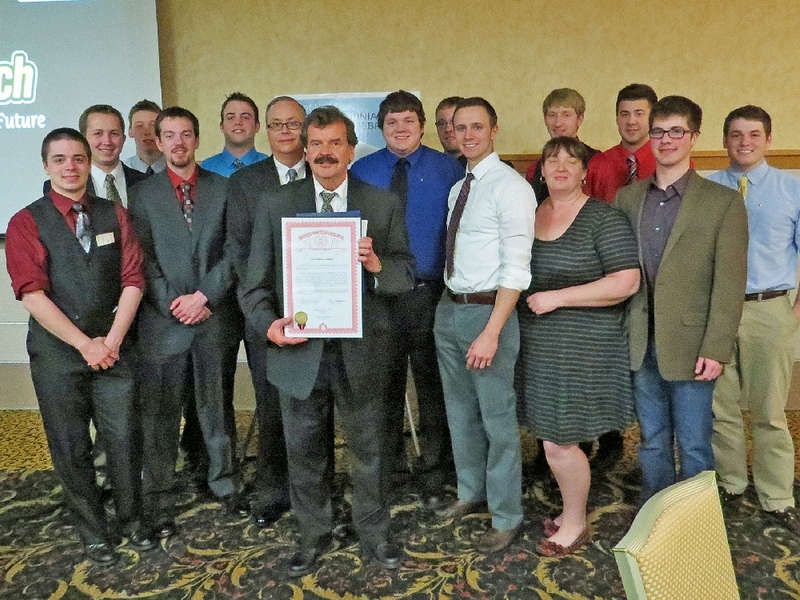 Members of Phi Kappa Tau Fraternity , with Alumni Association President Marty Schendel, pose with Mayor William Laitila and City Manager Glenn Anderson. 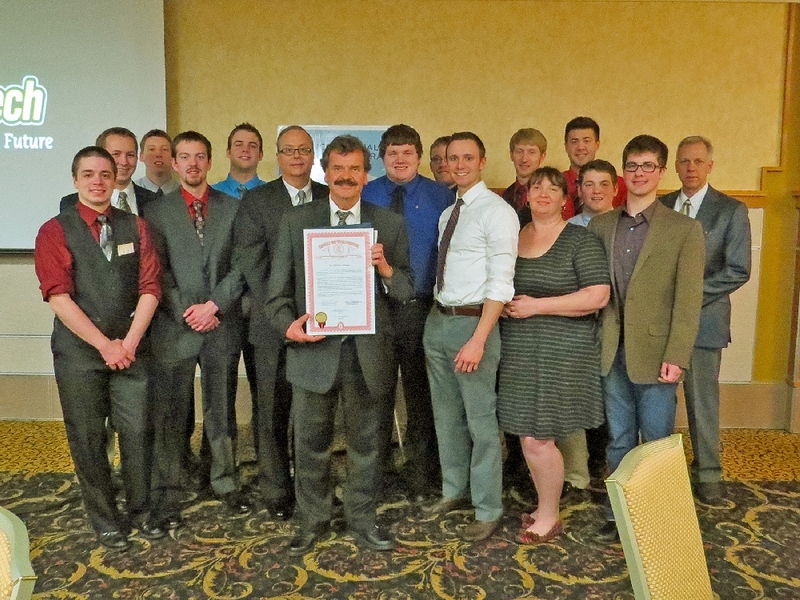 Phi Kappa Tau members with City of Hancock Officials during the Sesquicentennial Dinner April 12th. 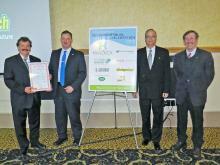 Mayor Laitila, City Manager Anderson with State Representative Scott Dianda and former State Representative Mike Lahti. State Senator Tom Casperson, Mayor William Laitila, State Representative Scott Dianda and City Manager Glenn Anderson shown receiving the State of Michigan Resolution signed by Casperson, Dianda and Governor Snyder honoring the City's Sesquicentennial Celebration of 2013. 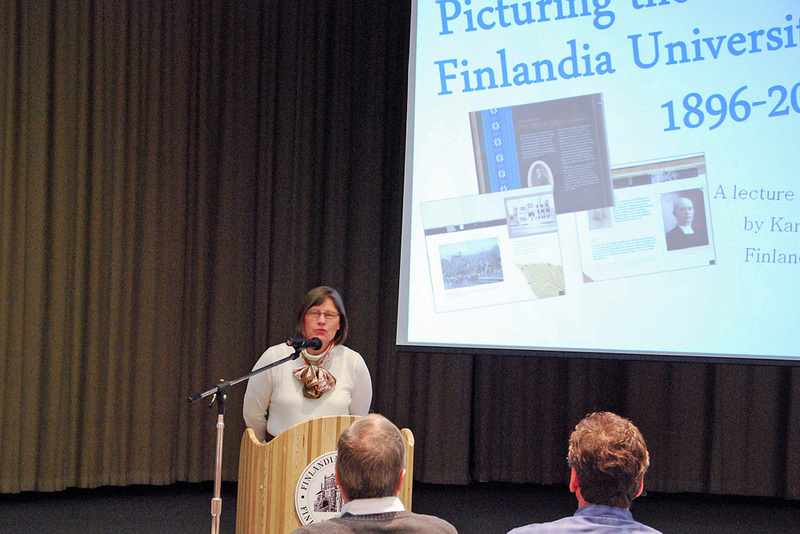 The Fifth in the year long Sesquicentennial presentation series, The Irish Immigration, was held in May, at the Finlandia Finnish/American Center, with a nice crowd on hand. 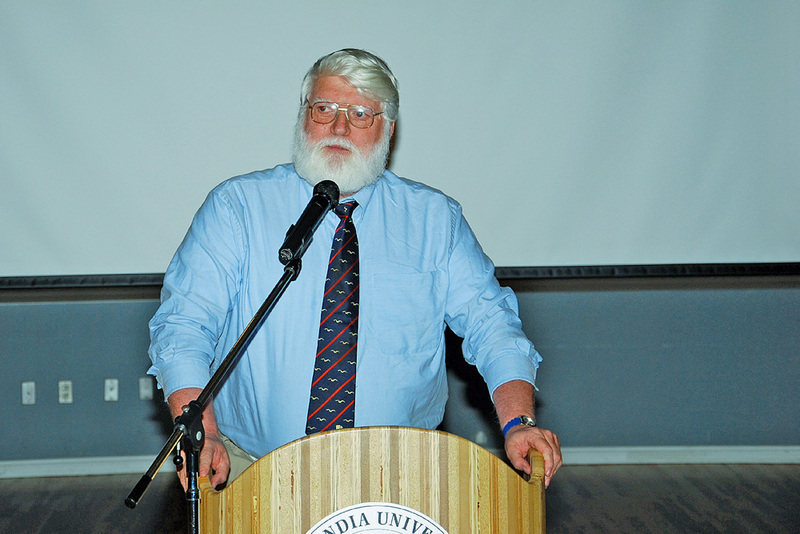 The presenter was Dr. William Mulligan, Jr., Professor at Murray State University, in Kentucky. In the mid to late 1800s, Hancock and the Copper Country were one of the principle destinations for Irish immigrants coming to America. They had a great influence in the development of the City and the area. 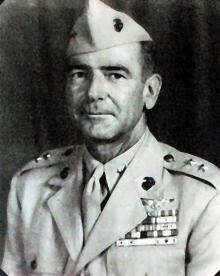 Dr. Mulligan taught History at Michigan Tech for some 20 years before moving to Kentucky. His presentation was well received. 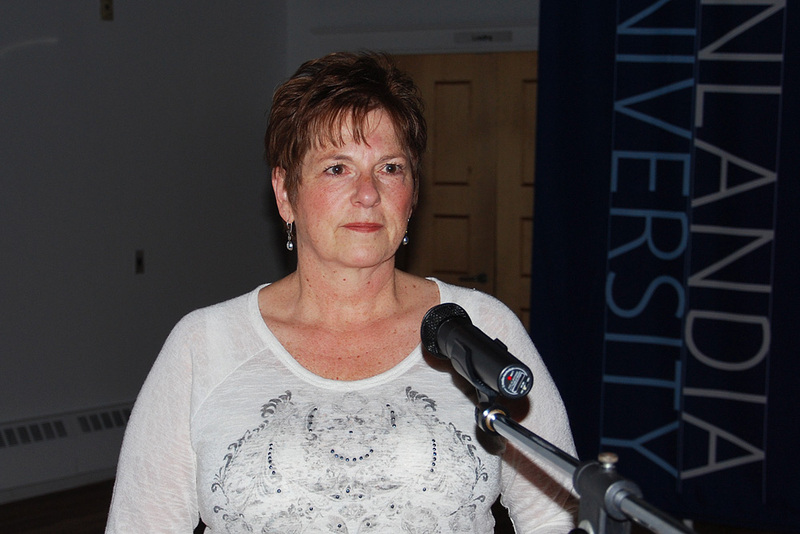 Mary Chase Perry Stratton - Journey of a Pioneering Spirit. 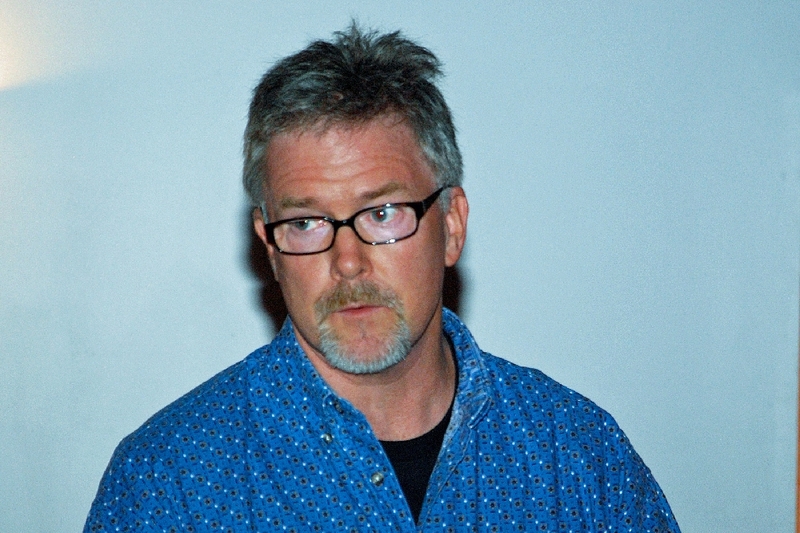 The Traveling Exhibition Welcoming Reception - June 6, 2013, at the Community Arts Center. A welcome back to Hancock for a renowned lady from Hancock, who co-founded Pewabic Pottery Introduction was by Stephen Smith, from Hancock High School, who authored a story of Mary Chase Perry Stratton, in the Sesquicentennial Book, who gave a background and accomplishments. 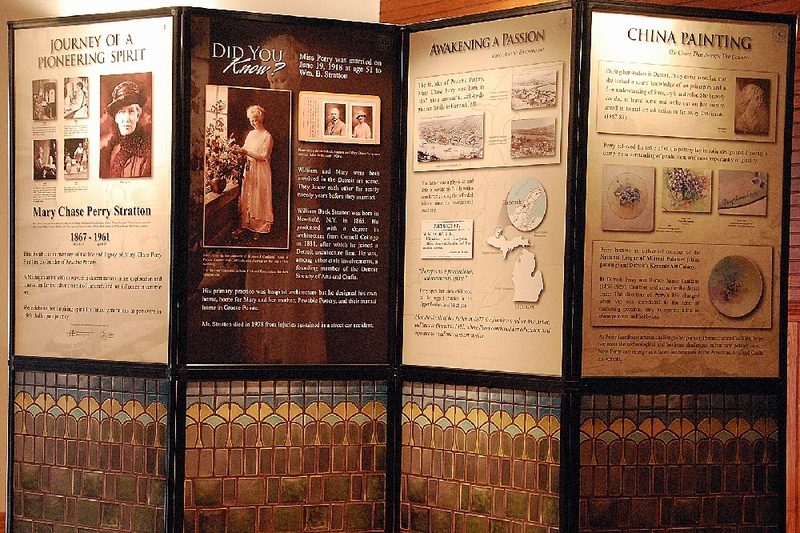 Some information about the original Hancock home and upbringing of Mary Chase Perry, from the last President of the Pewabic House Association, Denise Vandeville. The home is now owned by the Celtic Foundation, and is being renovated and restored. 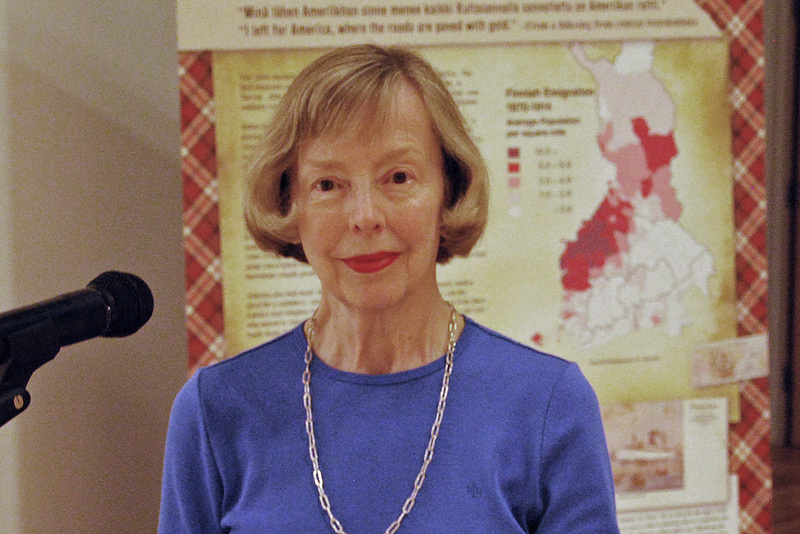 The seventh in the Sesquicentennial Series of Historical Presentations was held June 11th, in the Finlandia Finnish American Center, on the topic of Cornish immigration to the Copper Country. 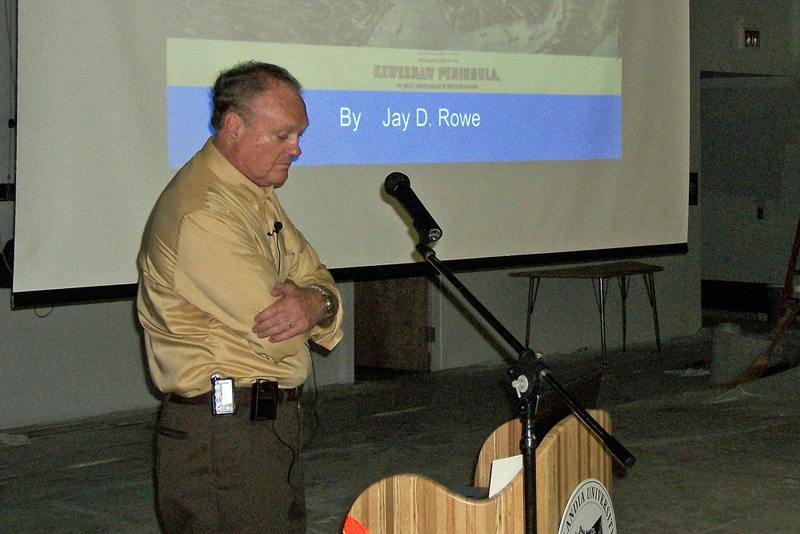 It was presented by local Historian Jay Rowe. 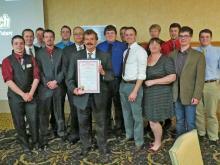 (Photo by Glenn Anderson). 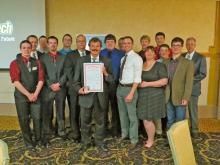 July 18th brought the eighth in the Sesquicentennial Historic Presentations. 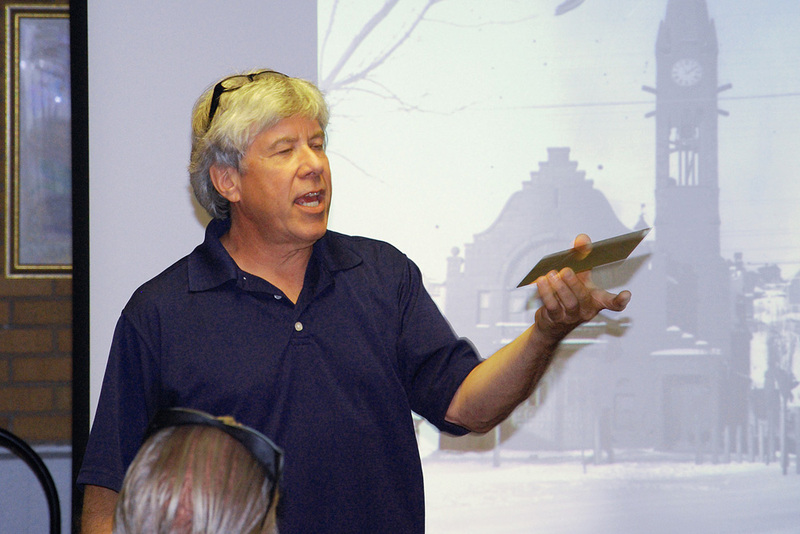 Jac Deo, owner of Superior View Historic Photography & Museum, in Marquette for many years, presented some of his collection of Hancock & surrounding area historic photos. The presentation also included some unique 3-D images. Here, Jack displays a glass negative plate used in the 19th century. An 1897 photo of the Hancock City Hall is on the screen behind. Major General John Condon (Marines) ... (see link at page beginning) September - Karen Hubbard gave an excellent presentation on Jacobsville Sandstone at the Finnish American Center in Hancock. 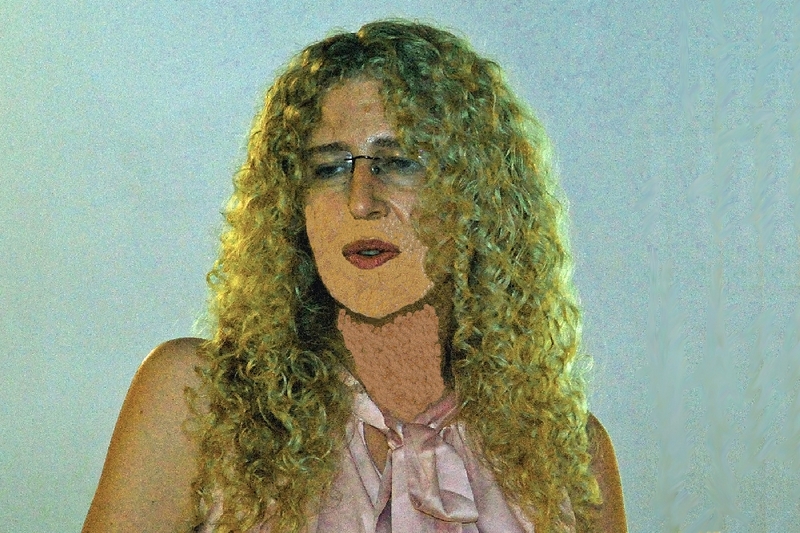 Her program featured the life of John Henry Jacobs, and included many of the buildings in the US that were built of local sandstone. 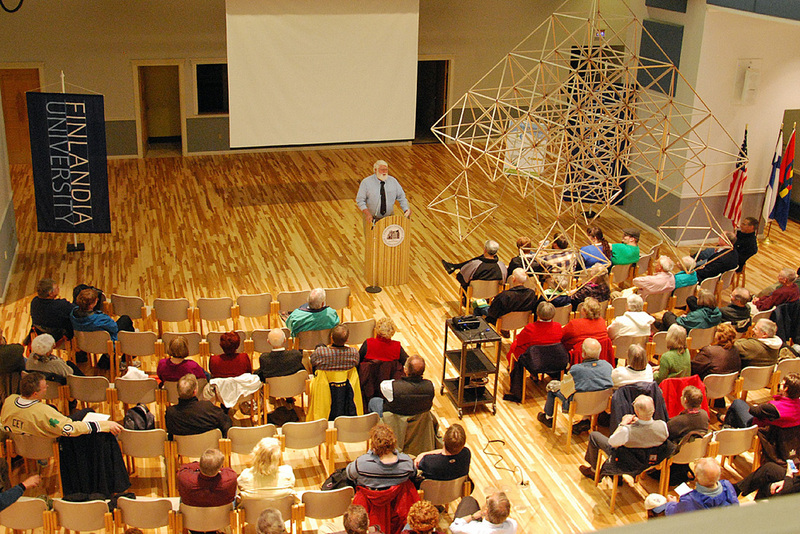 Dr. Larry Lankton, Professor Emeritus of History at Michigan Technological University (MTU), spoke in October, at the Finnish American Heritage Center at Finlandia University, on the Rise and Fall of the Portage Lake Copper District, from the earliest days to the peak of activity in the early 1900s . 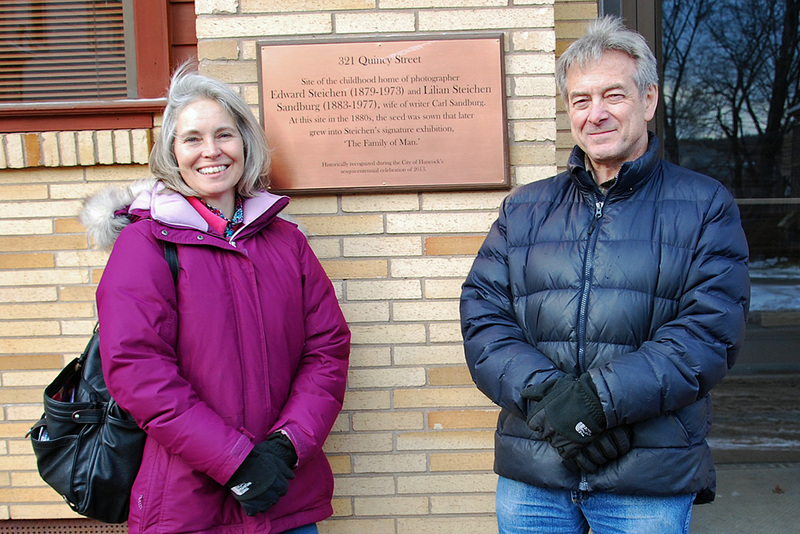 A plaque honoring the place where Edward Steichen, Photographer, was born and raised as a child, was dedicated November 18, 2013. 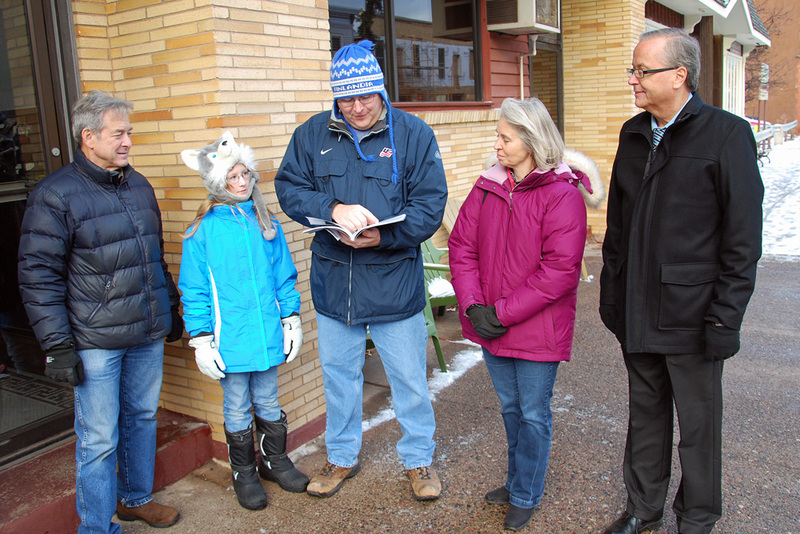 Here, Dave Doll, owner of the current building, along with John Haeussler, City Councilman and Sesquecentennial Chairman, along with City Mayor Lisa McKenzie and City Manager Glenn Anderson, listen to a few notes from a biography in the City’s Sesquicentennial Book. 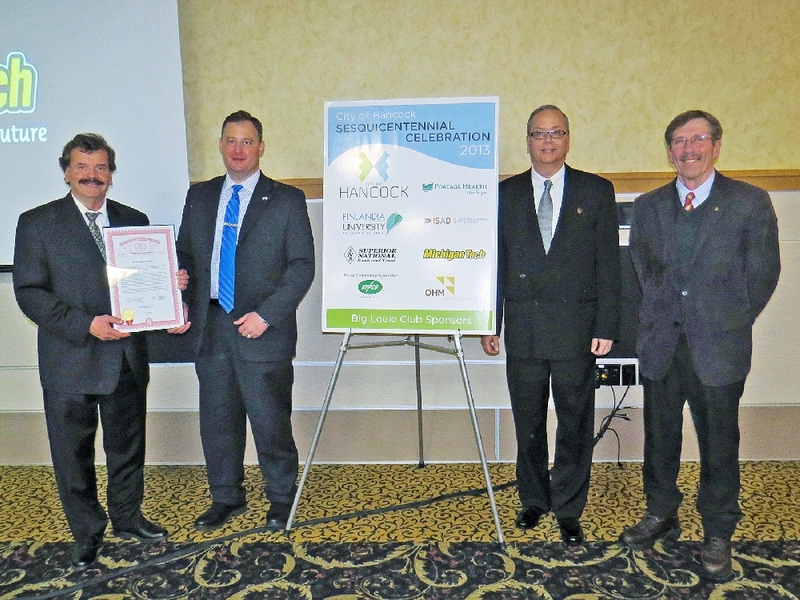 Dave Doll and Mayor McKenzie, with the new Plaque, at 321 Quincy Street, in downtown Hancock. 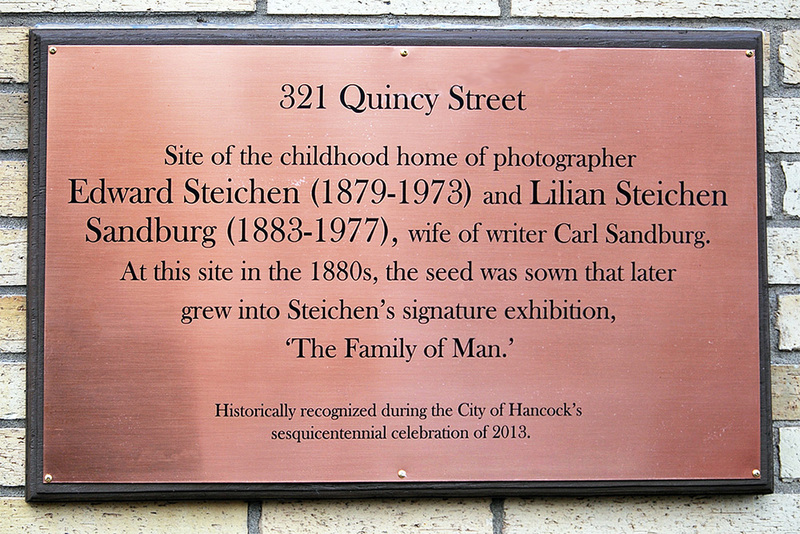 A closeup of the new copper Plaque honoring Edward Steichen. 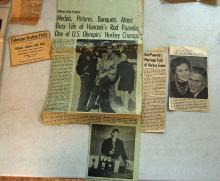 “Journey To The Surface”, Italian Families from Quincy Hill and Hancock. A final program in the 150th Anniversary Celebration, presented in honor of the many Italian heritage families that immigrated to the Copper Country. 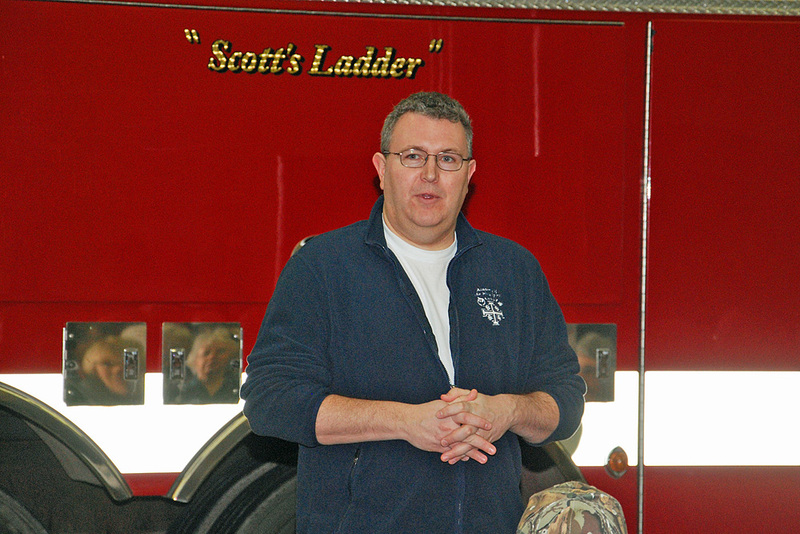 With many photos and stories, a great tale of the many people that made our area what it is. Presented by Deborah Mann. And so ends our Sesquicentennial Celebration, Thanks to everyone and anyone that played a part in making it such a success.